Valentino Valentina Oud Assoluto - 80ml - $148 - with top notes of orange blossom and cardamom; heart notes of agarwood (oud), bulgarian rose and leather; and base notes of saffron, vanilla and woody notes. 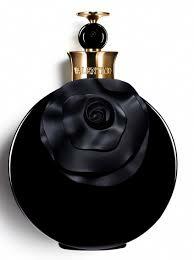 The notes were chosen by perfumer Olivier Cresp to unite Italian tradition with the richness and warmth of the Orient. This is not your everyday kind of fragrance and every time I've worn it now random people ask me what fragrance I have on and comment on how different it is. Love it or hate it, it's not your run-of-the-mill scent! I find it a little too much for day wear but it is my new fave evening fragrance. Available now exclusively at Holt Renfrew.